With over 21 years of family remodeling experience, Tom is able to provide the necessary information to make the renovation process go smoothly. He approaches each project as if it is his own enabling the client to see both sides of the project. With excellent communication skills, a designing eye and friendly personality, working with Tom is effortless and enjoyable. He will accommodate each and every need and is always willing to go above and beyond to make certain that both he and the client feel the goal has been achieved. As Organization Specialist Denise assists with each renovation project. By keeping detailed timelines of products ordered and services to be completed she will keep the project on target for completion. You will feel her smile and enthusiasm over the telephone while providing you with excellent customer service. 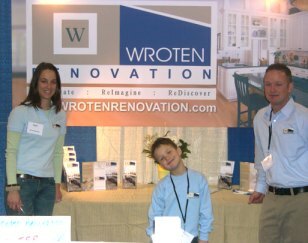 The combined skill and expertise of Wroten Renovation ensures each project is successfully completed above and beyond homeowner expectations. With a team of lead carpenters on staff, we are able to provide a variety of services to the homeowner. Each member of our team is dedicated to providing, clean, polite and friendly service to the homeowner. Our team attends courses, seminars and trade shows to remain experts on the latest products and home technologies, providing the best service available for our clients.